Figure 36.1. Box plot of κ FLC CSF concentrations in patients investigated for intrathecal immunoglobulin synthesis. Group 1: no detectable intrathecal fraction and no oligoclonal bands; Group 2A: MS patients, oligoclonal band positive; Group 2B other neurologic diseases, oligoclonal band positive. The median and 25th and 75th percentiles (shaded boxes), the 10th and 90th percentiles (error bars), and the outliers (black dots) are indicated. The cutoff for κ FLC concentrations (0.5 mg/L) is indicated (dashed line). (Republished with permission of Clinical Chemistry ; permission conveyed through Copyright Clearance Center, Inc.). Figure 36.2. Median values and ranges of κ FLC index in different subgroups. MS: multiple sclerosis; ME: meningitis/encephalitis; NB: neuroborreliosis; GBS: Guillain-Barré syndrome; CON: control. (Reproduced with kind permission from Springer Science+Business Media:  Figure 1). Figure 36.3. κ FLC index threshold line. sd: standard deviation. (Reproduced from PLoS ONE ). Figure 36.4. κ FLC threshold line in half-logarithmic diagrams with results of different patient groups. CIS: clinically isolated syndrome. (Reproduced from PLoS ONE ). A number of researchers have investigated FLCs in CSF as alternative markers of intrathecal inflammation to OCB testing . Historically, detection methods for CSF FLCs have included isoelectric focusing, quantitation by enzyme/radio-immunoassays and nephelometry but results have not led to routine incorporation of the test. However, the development of Freelite® nephelometric assays provoked renewed interest in the measurement of FLCs in CSF. Indeed, CE-marked Freelite assays intended for the measurement of FLCs in CSF (in addition to serum and urine) are now available for Binding Site SPAPLUS®, Binding Site Optilite® and Siemens BN™II instruments. Freelite CSF assays have been rigorously validated (Section 7.1.4) , and have now entered routine clinical practice . Fischer et al. studied CSF/serum pairs from 95 patients who had been investigated for intrathecal immunoglobulin synthesis. Oligoclonal immunoglobulin synthesis was identified in 71/95 patients, including 49 with multiple sclerosis and 22 with other neurological diseases. The median κ FLC concentrations in the CSF from both groups of patients with neurological diseases were higher than non-diseased samples (Figure 36.1) but λ FLC concentrations were found to be uninformative. When samples with increased albumin leakage were excluded, there was no overlap between normal and disease groups (cut-off level of κ FLC concentrations: 0.5 mg/L). This indicated that determination of κ FLC concentrations in CSF provided information similar to that of OCB measurements. However, in an accompanying editorial, Zeman  highlighted that the κ FLC index and other equations to determine intrathecal κ FLC synthesis may be preferable to using the κ FLC concentration, to avoid false positive results when sFLC concentrations are high or when blood-CSF barrier function is impaired. A κ FLC index is calculated using an equation analogous to that used for the IgG index, and incorporates the albumin quotient to correct for blood-CSF barrier function (κ FLC index = Qκ FLC/QAlb = [κ FLCCSF/κ FLCserum]/[AlbuminCSF/Albuminserum]). Several studies have demonstrated that use of a κ FLC index improves the diagnostic sensitivity and specificity compared to use of the κ FLC concentration alone . Presslauer et al. studied the use of a κ FLC index to diagnose MS in 438 subjects who underwent lumbar puncture. This included 41 patients with MS, and 29 patients with a CIS suggestive of MS. A control group (n=45) comprised individuals with normal pressure hydrocephalus, undefined dementia, or a primary suspected but unconfirmed subarachnoid bleed (and with no sign of inflammation). For the control group FLC CSF concentrations were low: κ FLC CSF median value 0.18 mg/L (interquartile range 0.13 - 0.22 mg/L); λ FLC CSF median value 0.16 mg/L (interquartile range 0.13 - 0.2 mg/L). sFLC concentrations were within the normal range, resulting in low κ and λ FLC indices (Figure 36.2, λ FLC index not shown). Similar findings were also reported by Arneth and Birklein . Presslauer and colleagues  compared the diagnostic performances of the κ FLC index, κ FLC CSF concentration, λ FLC index and IgG index using receiver operating characteristic (ROC) analysis. The test with the best performance (and highest area under the ROC curve) was the κ FLC index. Using a cut-off value of 5.9, the diagnostic sensitivity of the κ FLC index was 96%. Only 3 patients (1 MS and 2 CIS suggestive of MS) had a κ FLC index below this level (these patients were also negative for OCB and had a normal IgG index). By comparison, the diagnostic sensitivity of OCB and the IgG index (≥0.6) was 91% and 80%, respectively. The κ FLC index for the MS patients was significantly higher than those for the other disease groups (meningitis/encephalitis: p=0.003; neuroborreliosis: p=0.001; and Guillain-Barré syndrome: p=0.009, Figure 36.2) . Fifty patients without MS also had an elevated κ FLC index, resulting in a diagnostic specificity (for MS) of 86%; this was slightly lower than the specificity of OCB (92%), but distinctly higher than that of the IgG index (77%). Presslauer et al. concluded that the κ FLC index should be interpreted alongside clinical findings together with other CSF analyses (including λ FLC concentrations and the λ FLC index). The cut-off for the κ FLC index (5.9) proposed by Presslauer et al. has subsequently been validated by a number of other studies , and a very similar cut-off (6.3) was proposed by a very large multicentre study . Leurs  determined the optimal cut-off value for the κ FLC index in a large and heterogeneous population of CIS, MS and controls from 18 centres. In total, 775 samples (204 controls, 274 CIS and 297 MS) were assessed from patients with known OCB status. The optimal cut-off for the κ FLC index (6.3) was determined by Gaussian mixture modelling, and resulted in a diagnostic sensitivity that was higher than that of OCB analysis (94% vs. 86%, p<0.001). Although the diagnostic specificity of the κ FLC index was lower than that of OCB analysis (83% vs. 92%, p<0.001), the overall diagnostic accuracy of the two tests was very similar (89% vs. 88%). Alternative cut-offs for the κ FLC index have been proposed by Menéndez-Valladares et al. (10.62) and Bayart et al. (>12.45), and Zeman et al. concluded that FLC assays from different manufacturers are not interchangeable and that method-specific cut-offs should be used (Chapter 8). However, when all studies that compare the performance of the κ FLC index and OCB analysis for MS diagnosis are considered, it can be concluded that the κ FLC index is a reliable technique to detect intrathecal immunoglobulin synthesis, with comparable performance to OCB analysis (Table 36.1). Table 36.1 Published studies that compare diagnostic performance of the κ FLC index and OCB analysis. * Values reported for 2 OCB. ** All cut-off values were determined by ROC analysis, with the exception of Leurs , which used Gaussian mixture modelling. Presslauer et al. refined their cut-off for the κ FLC index by expanding the number of samples included in defining the normal range. CSF samples were collected from 861 patients who underwent lumbar puncture and after exclusion of patients with contaminated samples or possible inflammatory conditions, 420 control samples remained. κ FLC CSF measurements in controls were used to define the upper limit of normal for the Qκ FLC (κ FLCCSF/κ FLCserum) under different blood-CSF barrier conditions . Briefly, controls were divided into 23 subgroups based on blood-CSF barrier function (defined by the QAlb [AlbuminCSF/Albuminserum]). 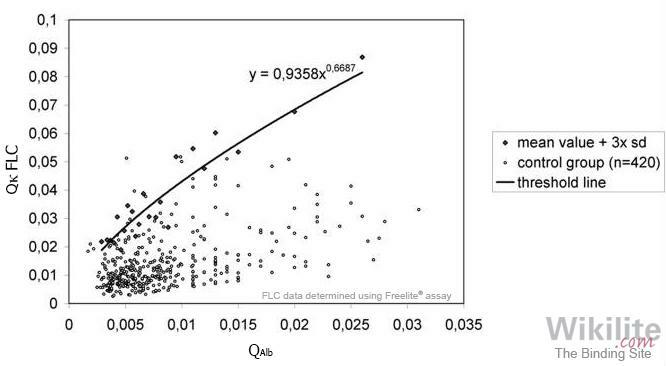 For each subgroup, the mean value of the Qκ FLC + 3SD was plotted against the mean QAlb to produce a κ FLC index threshold line (Figure 36.3). The upper limit of the threshold line included 98% of control patients (i.e. the diagnostic specificity was 98%). Intrathecal immunoglobulin synthesis (defined by a κ FLC index above the threshold line) was detected in 97% of MS patients (n=65, Figure 36.4A) and 97% of CIS patients (n=69, Figure 36.4B) . In both MS and CIS, the diagnostic sensitivity of the κ FLC index was superior to that of OCB detection or the IgG index (Table 36.2). 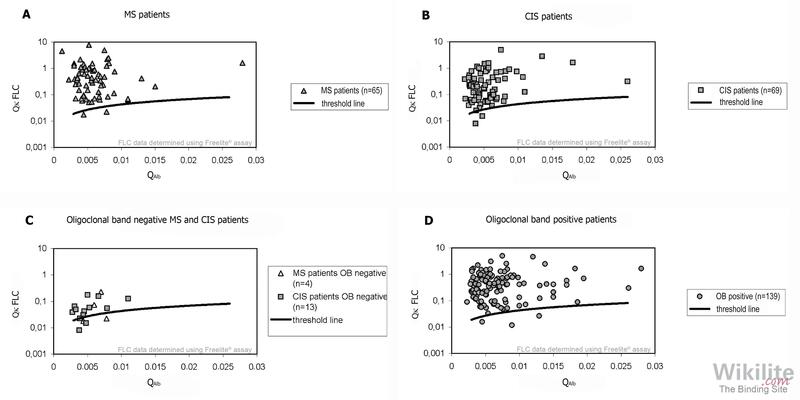 In the subgroup of MS or CIS patients who were negative for OCB, 76% had elevated κ FLC index values (Figure 36.4C). This suggests that κ index can detect very low plasma cell activity in the CSF, beyond the analytical sensitivity of IEF. Of the patients who were positive for OCB, 98% had elevated κ FLC index values (Figure 36.4D). The authors concluded that the measurement of κ FLCs in CSF should become a first-line screen in diagnostic algorithms for MS and CIS . This conclusion was also shared by Valencia-Vera et al. who proposed that OCB testing is unnecessary when the κ FLC index is either >8.33 or <0.92, as diagnosis of MS is either highly likely or highly unlikely, respectively. They estimated that this approach would reduce the requirement for OCB testing to only 45% of requests. Brivio et al. recently validated the use of the κ FLC index threshold line in a study of 59 patients with MS and 31 controls (with a non-inflammatory disease of the CNS). The threshold line provided good separation of the two populations, with superior performance compared to that of OCB detection. The κ FLC index threshold line has also been validated by a multicentre study conducted in Austria and Germany . Other studies have not been able to establish a non-linear threshold, due to the small number of samples included in their analysis . However, many conclude that use of a linear cut-off for the k FLC index is an adequate surrogate measure for intrathecal immunoglobulin synthesis. Table 36.2. 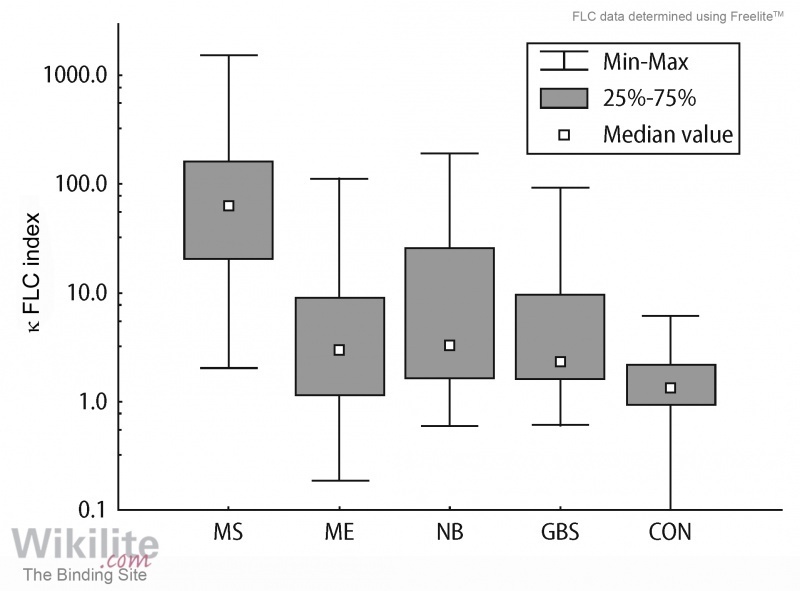 Diagnostic sensitivity of oligoclonal bands, IgG index and κ FLC index in MS and CIS .